Dafabet have been making strides in the online betting market since they launched the website in 2004. 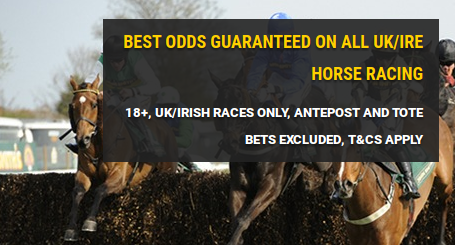 There are a few special offers listed in the Promotions section of the site, one of which is Best Odds Guaranteed on all UK and Irish horse racing. This is particularly appealing for a lot of online bettors due to the fact it can add a lot of value to a bet for not a lot of effort. If you are not familiar with Best Odds Guaranteed, it means that if you have placed a bet on a horse at fixed odds and the Starting Price (SP) is bigger than the price you took, Dafabet will pay you out at the bigger odds. Whichever price is bigger between the SP and the early price taken is the price that Dafabet will give you upon settlement of the bet. As an example of how it works, if you placed a £30 bet on Jupiter Light to win a race at Sandown with odds of 6.00 and it won, the returns would be £180. If the SP had drifted to 6.5, the returns increase to £195, adding £15 to your winnings. In order to make sure you qualify for the Best Odds Guaranteed offer, please be aware of the terms and conditions. Firstly, only customers from the UK and Ireland can benefit from this. The offer does include bets placed at Board Prices and Early Prices. It can also be used on Singles and Multiples, on the Win and Each-Way Market. Excluded from this offer are; Ante-Post bets, Tote/Pari-Mutuel bets and International Racing from outside of the UK and Ireland. As free bet stakes do qualify for the offer, we can use matched betting techniques to potentially win even more. When placing a back bet on a selection and a lay bet against the same selection, you could win more if the bookmaker bet wins. As the welcome offer gives you the opportunity of getting a £30 free bet if your first bet loses, this can be used to add extra value. If the £30 free bet was placed on Excellent Sounds to win at Haydock with odds of 8.00 and laid £24.85 at odds of 8.50, your profit would be £23.62 if the horse was to win. Though, if the Starting Price drifted to 8.5 and the horse won, your profit is increased to £38.62. Thus, you would get an extra £10 on top of your expected profit thanks to Best Odds Guaranteed.